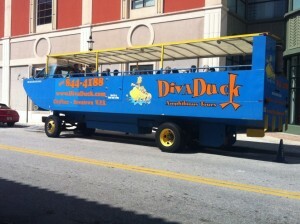 Whether you are are a local here or visiting from out of town, you will not want to miss Diva Duck. This 39 foot half-bus, half-boat vehicle is approved by the U.S. Coast Guard so it is safe. Loads of fun for the entire family especially children who will get a kick out of this tour especially the part where you do the “BIG SPLASH“. Climb aboard this totally funny looking amphibious vehicle which will take you on a 75-minute tour of the city and neighborhoods of old West Palm Beach. Safety is very important so the captain goes through guidelines with everyone. Always very friendly, all the tour guides are so delightful, entertaining the passengers with lots of historical information, jokes and music. The tour takes you on around the Clematis Shopping District, the Palm Beach County Convention Center, Lake Worth Lagoon, the Flagler Museum and the Kravis Center. Once on the Intracoastal Waterway you will view the homes of the “Rich and Famous” in Palm Beach as well as the John F. Kennedy Bomb Shelter, Peanut Island and the Port of Palm Beach. Something different to bring out-of-town friends and family members as well as people visiting from up north. So come along on this unforgettable experience and discover what’s everyone talking about!